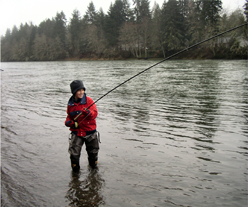 Each year, Clark-Skamania Flyfishers offers several classes to its members and the public. The classes provide students with a high level of instruction at a very low cost or at no cost at all. Learning to flyfish and acquiring related skills will make you a better angler and will increase your fishing enjoyment. Click on the links below for details. The club maintains a comprehensive library for the exclusive use of members. To view or download a copy of our Library Catalog, click here. Click here to view CSF's collection of knot-tying videos. Visit our conservation page to learn more about our continuing conservation efforts, or see our list of officers to contact one of our conservation chairmen.